I purchased some soap texture mats…and I really don’t know how to use them… Can anyone tell me or post a video on it… It would be much appreciated. Textured soap mats are so much fun, you are going to have a blast using them! 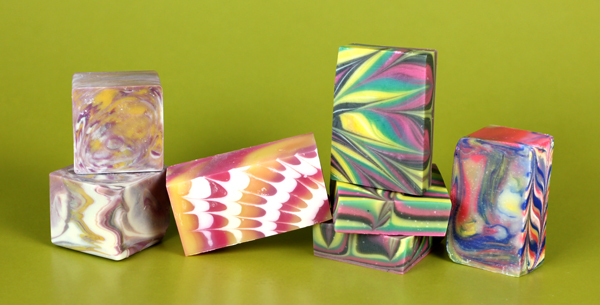 The best way to use them is to lay them in your mold (we love the Silicone Tray Mold for using soap mats) and pour your soap on top! You could also cut down your mat to match any of your molds at home, there are just so many things you can do with the soap mats and they are super easy to use! 2012 SWI was great! I conquer with all the suggestions put forward by all, and would like to add a couple more. Facial soap MP and CP, also how to photograph soap or bath products for a portfolio or even website. What about a format where you could sign up for just one day- focus on soaps one day and lotions etc the second day. More folks could perhaps afford 1 day. I would love to know how to make “Bubble Bars”. It would be great to be able to buy a kit with instructions. I love all of the ideas so far! And along with that I’d like to have a class on making bath bombs. I can’t seem to ever get two batches the same consistency or hardness. My bombs, although still nice in the tub, never get rock hard and have to be wrapped so they won’t crumble apart. I’d like to know how to create a consistent product. That was supposed to be silicone. CP textures on loaf like when curls & pieces are used to decorate or how to work with liquids like coffee, milk, beer, juice. Or cilicine mold making. Or how to package, where to get labels, printing, different wrapping and where to buy. Or that swirl with the cardboard down the center. Or m&p embeds in cp soap. Or how to make your own wooden soap mold. I’ll stop now! Great suggestions! I love the embedding curls idea. That seems to be a popular technique right now. I would love to see more swirl techniques. I do swirl…but it doesn’t look as nice as some I see! Harder to do than it looks! Asheville workshop..I would try to make that one! All of the above! I would help organize a workshop in the Asheville area of NC! Any form of advanced CP swirling would be great. I would love to see more premium videos teaching advanced techniques. That’s a wonderful idea Traci! Have you been able to check out all the advanced technique videos we have available on Bramble Berry’s website? That’s a great idea Yvonne! While we don’t have that up at the current moment, I think that is a fabulous suggestion. We do have two DVD’s available on Bramble Berry website that teach how to make cold process and melt and pour soap, and we are hoping to get more up! Being in NY, I’ll probably never make it to your classes–but I’d love a weekend to learn about using herbal and clay colorants in CP with hands-on practice. soap classes will interest me. You know what would be great…a virtual SIW (for those of us who live on the East coast and can’t quite convince their husband to travel to WA all in the name of soap!). But seriously, maybe you could check out what Papertrey Ink is doing with their weekend Stamp-A-Thon…maybe something like that…or even what Amay at Greatcakes Soapworks has been doing with her weekly challenges…I know I would really appreciate it…maybe something at a premium level, where there is a charge to participate but you get access to special videos, or even but some kind of kit to participate. How did I miss this? It really is a great idea…Amy’s challenges and videos really helped me to refine some techniques that I *kinda* knew but needed some help with. Looking forward to BB’s challenges! I want to go so badly, and I’m soo close by, but I just got into soaping so I feel like I need some more experience under my belt before something this intense. Maybe next year! I have been amazed by landscape soaps..I would love to learn how to do that! We have a Soap Week Intensive every year and we hope you can make it out one year, we’d love to have you! I so agree with you Jennifer, embedding is one of my favorite things to do in soap! Piping soap 🙂 I admit I’m slightly obsessed with piping. But there are so many different cool things you can create with piping from cakes to cupcakes to even cool loaf designs…so many different possibilities! I have fun with it and I think it’s something others might enjoy too. That’s a great idea Jennifer, thanks for the suggestion!